Parquet flooring has the decorative appeal other materials can’t offer. Deriving from the word parquetry, which is a mosaic of wooden pieces, it can be used for furniture and block flooring patterns. The patterns achievable with parquet flooring tend to be angular, such as squares and triangles. There are a whole range of woods used to create the parquet flooring effect. Oak parquet flooring tends to be the most popular, but walnut, cherry, pine and maple are all available. There are also the more expensive options such as mahogany woods. You can choose parquet flooring for whatever room you see fit, and many homeowners opt to have it installed in their dining room to create a lavish aesthetic appeal. Parquet flooring offers easy maintenance and just like laminate, can be brushed or mopped clean. It would be recommended to avoid vacuum cleaners mind, as grit can be trapped in the spinning brushes and scratch the surface. 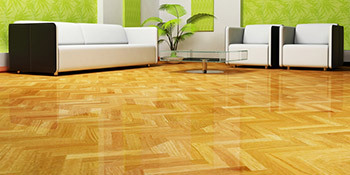 However, parquet is notorious for its durability and longevity. With their hardwearing properties you’ll even find this type of flooring in bedrooms and hallways. Because of their warmer underfoot feel, they’re often seen as a better alternative to floor tiles. Parquet flooring offers something different for properties, to set a room apart from usual carpeted or laminate looks. With easy maintenance and hardwearing properties, parquet flooring is a fantastic option for homeowners looking for something different. If you’re interested in parquet flooring installation, why not complete our quick form and receive up to four FREE quotes from local, vetted and reputable fitters. Project: Hall,L ounge, dining room,, parquet repair and sanding and sealing. hall size 3.61x3.03 lounge size 5.15x4.26 dining size 3.65x3.32. Project: Laying approx 35m2 of parquet flooring across two rooms. Flooring (teak) will be reclaimed to as to match original 1970’s original already/ still found in other rooms of the flat.